Overview: APMEX, American Precious Metals Exchange, is the world’s largest online retailer of precious metals. The company started its operation in 1999 and is headquartered in Oklahoma. The product range of APMEX includes silver, gold, and platinum. In addition to this, the company also offers Mint bullion products online, including Platinum Eagles, Platinum Maple Leafs, Platinum Commems, Silver Eagles, Pre-1933 US Gold, and a number of other products. Since APMEX’s product range includes a variety of precious metals products from jewelry and bullions to IRA products, its customers range from individual investors and collectors to even banks and brokerage houses. Variety of payment options, including cashier’s check, certified check, money order, credit card, and check. APMEX Club rewards for frequent purchases. These include exclusive offers and free shipping. As far as the first impression goes, APMEX has a well-developed website that boasts organizational clarity, quality content, excellent navigation, and clean, crisp graphics. The information is well-sorted in the form of tabs and menus which makes it easier for the user to get to the desired section of the website immediately. While conducting our APMEX review, it was noted that the website provides investors precious metals spot prices, live charts, and other valuable information on the homepage. This makes it easier for the visitor to find updated market data on their desired precious metals with just a few clicks. The ‘education’ section of the website, which is a part of the ‘Why APMEX’ dropdown menu, contains all the precious metal investment information an investor may need. From investment guide and a video tutorial to APMEX blog which contains updated news articles on recent market changes, the section contains highly useful information for precious metal buyers, collectors, and investors. Another distinguishing feature of the website is the ‘Deals’ Section. Highlighted in red, the section immediately grabs the visitor’s attention. It contains various special-occasion discounted APMEX vault deals. The APMEXclusive section contains unique precious metal products which cannot be found anywhere else. Just for reference, the section features silver bullets, silver shamrock bullion, silver heart and stars, and even a silver coin featuring the colored version of the web-slinging hero, Spider Man. Being the world’s largest online retailer of precious metal products, APMEX maintains a strong online presence on all major social platforms, including Facebook, Twitter, YouTube, LinkedIn, Pinterest, and Google+. 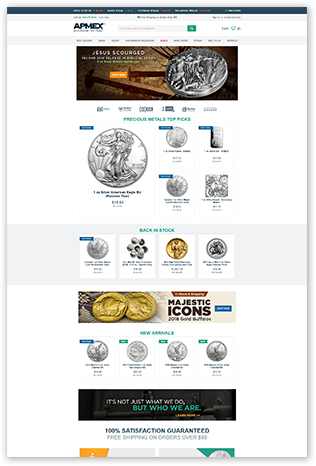 It is worth repeating that APMEX is the largest e-retailer of precious metals, and this is also reflected in the official website which is sleek, stylish, and responsive. The extensive precious metal products range of the company presents investors with a variety of options to expand their investment portfolio. In addition to this, the step-by-step precious metals investment guide and instructional videos make it easier for even the novice investor to buy precious metal products in a hassle-free manner.